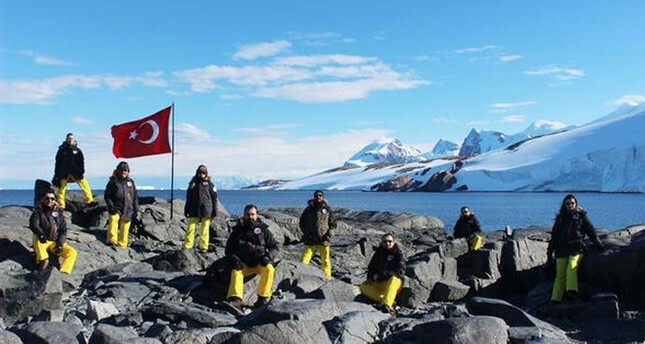 Turkish scientists, who participated to the 2nd National Scientific Expedition, pose in Antarctica last year. Turkey has been involved in studies in Antarctica for the last 50 years. However, its latest mission, the 3rd National Antarctica Science Expedition, would open a new page in its drive to further explore the frozen continent. With the third expedition, Turkey, which currently has an "observer" status, looks to become a "consultant country," in the new term of the Antarctic Treaty system and continue scientific studies at its own base. Although Turkey's mission to Antarctica has picked up the pace in the last couple of years, things were not as smooth when the country first set its eyes on the continent. Ottoman admiral, navigator, geographer and cartographer Ahmed Muhiddin Piri, known as Piri Reis, was the first man to draw a detailed map including the far end of South America, which was the nearest landmass ever depicted of the continent of Antarctica. After Piri Reis did so back in 1513, Turks did not put much thought into Antarctica. The first Turks to travel to Antarctica on scientific purposes was Atok Karaali, who conducted studies at the U.S. base, Plateau Station in 1967. After that, many Turkish scientists have headed for the white continent for scientific research; however, the names of professor Serap Tilav, the first Turkish woman to travel to the South Pole, professor Umran İnan and Ataol Karaali were immortalized with the geographic formations named after them, such as "Karaali Rocks," "Tilav Cirque" and "İnan Hill." Since 1967, more than 50 Turkish scientists have set foot on Antarctica, making names for themselves with new discoveries documented in international literature. A boat carrying scientists passes near icebergs in Antarctica. Turkey's 1st National Scientific Expedition to Antarctica was undertaken in cooperation with Ukraine's National Antarctica Research Center in 2016. During the first national mission to the continent involved a total of 13 scientists from seven universities and the Turkish Scientific and Technological Research Council (TÜBİTAK). However, for Turkey to become a "consultant country" and focus its scientific studies on a certain area of the continent, Turkey needs to build a base. Hence, with the initiative of the Industry and Technology Ministry, under the coordination of Istanbul Technical University and the auspices of the Turkish presidency, Turkey launched the project for building a science base in Antarctica. The first phase of the 2nd National Scientific Expedition began with nine researchers in 2017, and the scientific team managed to cover almost 4,000 kilometers over a period of one and a half months. During the expedition, the team conducted studies involving numerous branches. The second phase of the expedition was launched with 28 researchers and for the first time in Turkey's history Turkish scientists set up a Turkish camp in Antarctica, at a location known as Robert Island. Turkey's internationally recognized National Arctic Science Program aims to make scientific studies in Antarctica sustainable. It was established with the efforts of the Industry and Technology Ministry in 2017. The program, which draws Turkey's Antarctica road map, encourages original scientific studies on arctic life. Antarctica expeditions, in cooperation with other countries and the construction of a Turkish science base on the continent, are the primary goals of the program. Although the national science expeditions take place at certain periods, Turkey also sent 12 scientists to the research bases of different countries, including Poland, Belgium, the Czech Republic, Bulgaria and Chili, in 2017 and 2018. As the feasibility study for a permanent Turkish research base in Antarctica continues, a temporary base will be built during the current Turkish expedition that kicked off earlier this week.